A runner that desires to run sprints well usually follows the path of wearing a lighter, less cumbersome shoe. The goal of a sprinter is to get from point A to point B as quickly as possible with the least amount of resistance. 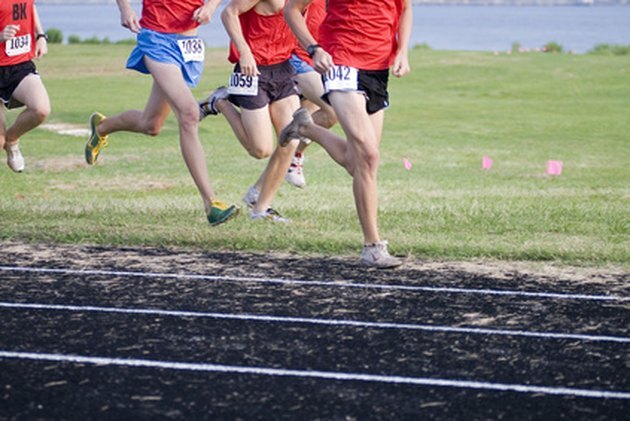 A sprinter has the choice of using a sprint spike, a racing flat or a light weight training shoe. His choice rests on his personal preference of what feels most comfortable, and enhances his running performance. While every runner has her own unique style and individual needs, in the case of sprint spikes, one style suits all. This is the case because as the runner sprints, she tends to spend most of her time on the ball of her feet; and by its design, a sprint spike promotes this action. No matter what the brand or model, a good sprint spike will usually have a stiff plastic or hard rubber plate under the forefoot that literally forces the sprinter up on the balls of her feet. A good example is the Nike Zoom Ja that has a very breathable, lightweight upper and risers that can be stacked over each spike for additional traction. Add to the fact that a spike is aptly named, because it has a set of sharp ceramic or metal spikes that are screwed in this forefoot plate for aggressive traction. Most track spikes are fit to men's sizes, with more female specific spikes being made available each year. Racing flats are one step above sprint spikes in weight, but still very, very light, minimal running shoes. Compared to a regular training-running shoe, which can weigh 11 to 15 oz., a flat will usually weigh in at 6 to 10 oz. A racing flat is a good choice for a sprinter who finds spikes too hard on his feet because they have no cushioning and a hard forefoot. A racing flat has more of the qualities of a regular-cushioned running shoe, but with minimal cushioning compounds, and super light weight materials that form the upper part of the shoe. In 2010, Brooks introduced the Green Silence racing flat that has received positive reviews. The shoe is constructed entirely of recycled materials and features asymmetrical lacing for a snug fit, minimal heel height and weight. This allows the sprinter to maintain the needed minimal, lightweight feel of the shoe, but with a bit more protection, comfort and cushioning. Training shoes, or running shoes that contain a maximal amount of cushioning compounds to absorb shock, are not generally the choice of sprinters. There are those sprinters, however, that may be prone to injury while running in minimally cushioned shoes or a simply uncomfortable in them. Even though a training shoe may be heavier, the extra cushioning may help the sprinter perform better, because of the superior impact absorption. The Nike LunarGlide is a lightweight training shoe that features the new LunarLite cushioning compound instead of Nike's traditional compressed air pockets for cushioning. With a small amount of stability built in, the LunarGlide is ideal for a sprinter seeking more support and cushioning without adding much weight. No matter what the manufacturer or shoe model, the shoe needs to be correct for the individual's foot type and comfortable. Why Are Running Spikes Better Than Regular Running Shoes?